Growing up, ebelskiver was a welcomed treat. Depending on the season or what was on hand, the fillings could be anything from jam to cheese. With the cool fall weather and seeing pumpkins everywhere, I’ve been looking for a recipe for a good pumpkin filling. I actually found a Pecan Pumpkin Filled Pancake recipe on the Williams Sonoma web site (where I bought my ebelskiver pan a few years ago). Because I don’t have access to their pumpkin butter (and it’s most likely not gluten-free) and because I use my own gluten-free pancake mix, I’m going to have to experiment a little to get just the right filling. The trick with the batter is to make it lighter than a pancake batter by whipping the egg whites and folding them in. Other than that, it’s fairly easy to make ebelskiver if you have the pan and your filling options are limitless. So the windows are open, the cool breeze is coming through, and I’ve got some ideas on what to do. And just maybe I’ll end up doing them all (jam, cheese, pumpkin, cream cheese….!). Any other ideas? I had forgotten about ebelskivers until now. When we lived in California many years ago, we had them in Solvang. They were so good! I’ll have to see if I can find them anywhere around here. Thanks for reviving the memory of a great time spent in the quaint town of Solvang. I’ve never heard of these but they sure do look delicious. Being in France I know crepes of course. We usually just use butter and sugar as a filling, sometimes adding Grand Marnier. Living in Santa Barbara, ableskivers used to be the only reason to visit Solvang, oh unless you needed clogs. Now Solvang is home to wonderful wineries and great hotel/spa getaways. But ableskivers still rule! Try a little ricotta cheese with a little sugar, grated orange or lemon zest and some roughly chopped dark chocolate. Oh, yum! 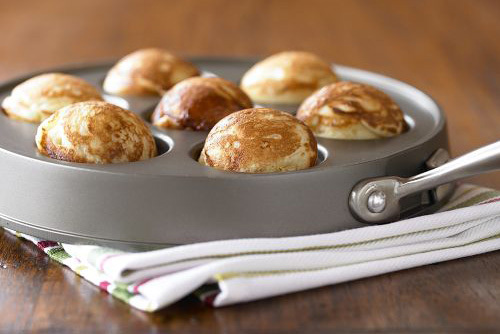 Thanks for the reminder that my ableskiver pan sits unused in a cabinet. This is the perfect answer for what to do with some of the apples we picked recently. Stonewall Kitchen has a maple pumpkin butter that contains the following: pumpkin puree, pure cane sugar, brown sugar, maple syrup, water, modified cornstarch, citric acid and spices. would you post your recipe? Basically what Lidna said. Crepes – yum! so I’ll go find some recipes sounds really yummy thanks!